WordPress is the most popular Content Management System (CMS) and platform for developing websites today. There are many WordPress themes available all over the web, so many, that it’s tough to select the best one. Often, you’ll hear comments in the WordPress world that free themes are risky because people think they are not supported well enough, or they are designed by amateur developers. While this is not false, some free WordPress themes come with features that are just too good to be true. From parallax effects, social sharing, responsive design, multiple page layout, widget support, SEO enablement, theme customization, to beautiful booking pages, each one of these themes has powerful components to make you think twice about paying for a theme. Without further ado, let’s dive into the 20 plus 1 best free and responsive WordPress themes you can use for your WordPress website in 2018. Hestia is a clean and free responsive WordPress theme that uses the latest UI design trends. It has a one-page design with smooth scrolling, and a modern, artistic look. Hestia also has an online shop that borrows Pinterest’s design and a full-width featured slider. Sydney is another clean and responsive WordPress theme for businesses of any kind, with a full-screen slider, a smooth scrolling, and beautiful animations. This theme has a professional look, a widgetized footer, and a simple design. It also has a modern and beautiful interface and comes with colourful sections. A stylish theme for lifestyle and fashion blogs or magazines, Anariel Lite comes with a minimalist design, but the elegant typography, the carefully chosen colours, and the great sidebar elements can turn your website into an optimal solution that will make your content stand out. Orfeo is a free and highly responsive WordPress theme for small businesses, startups, niches, and product pages. Its smooth one-page design, along with the modern appearance and clean sections makes it a great choice for your promotion campaigns. Zerif Lite is an interactive theme, designed to be a single-page theme. It has a full-width image in the background and a simple white menu bar at the top that’s good for written posts. The main colours are black and white, but some sections skip from a classic to a more vivid light green, yellow or red. The design overall is an elegant and classic one. ShopIsle is an elegant and modern theme for e-commerce websites, with a full-screen slider and a clean responsive design. The theme was made to be compatible with any kind of online shop and to give your content a fresh, friendly look. ShopIsle has a video ribbon, a smooth scrolling, and a classy layout that will make your products visible. ColorMag is another clean and responsive theme for magazine, newspaper, and publishing websites. This theme has an elegant and beautiful look, with colourful buttons, featured slider, and a flexible content structure. ColorMag has a multipurpose design, which fits any topic you want to write about. Allegiant is an elegant and minimalist theme for businesses of any kind. Its multipurpose and flexible design allows you to use it for startups, agencies, portfolios, and many other purposes. It is clean, has a full-width animated slider, and comes with a lot of customization options. OnePage Lite is a clean and very responsive free WordPress theme and comes with clearly separated sections that make for a consistent and clear visibility and user experience of your website. You can use the space at the bottom to display your latest blog posts and give them additional visibility. The theme is also optimised for SEO operations. This modern and friendly theme was built to fit any business site, whether you’re a startup, corporate and creative business, digital agency, or e-commmerce webiste. OnePress has an elegant look and a neat one-page layout. Oblique is a masonry WordPress theme for personal blogs, with a dark skin and minimalist design. The name comes from its header and shapes of the posts. The theme has a slide-out left menu and a vintage black-and-white look, with colourful sharing buttons. Astrid is a beautiful and colourful theme for small businesses and agencies, with a modern and catchy design. It can fit both creative and corporate purposes. It also has an interesting full-screen layout, with great visualisations. Spacious is yet another minimalist, but multipurpose free WordPress theme, with a clean, user friendly and responsive look. This theme uses colourful icons and buttons, a boxed layout, a beautiful featured slider, and an arranged content, so it can occupy less space. RokkoPhoto Lite is a great and catchy theme created for photographers. It has a full-width header image and various photography sections, presented on a white background. The sections are organised according to categories. Every post has a fully featured image and when you scroll, down they show up with a fade-in effect. You can notice the simplicity of this Bootstrap WordPress theme, which makes it elegant and classy. Zillah is a stylish theme for bloggers looking for a simple and elegant online presence. This theme is friendly, modern, and helps your content get more views. Also, it loads fast and comes with a clean and sleek design. 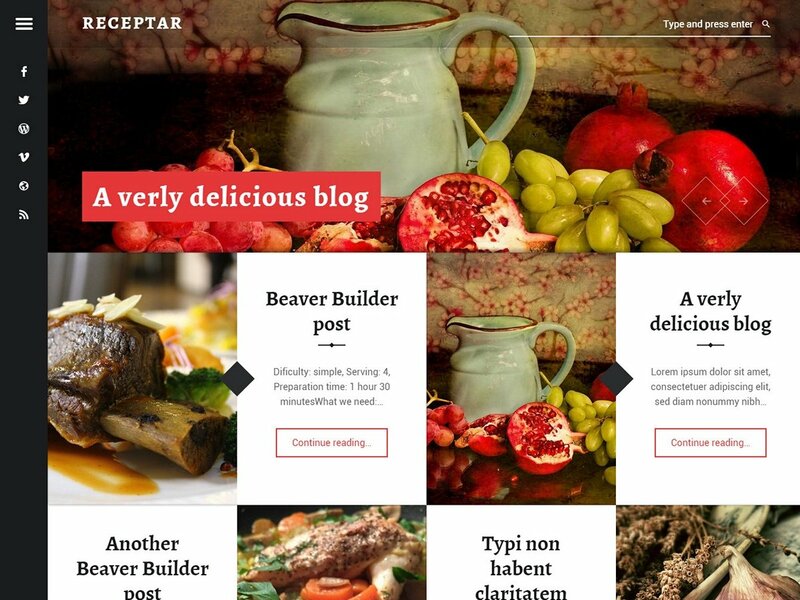 As the name implies, Receptar is a very classy theme meant for restaurants or other food and drink-related businesses. The design offers a homely feeling when you view it. It has light colours like pink, blue and grey, and an overall friendly vibe that would keep your website visitors salivating for your menu. Latte is a modern one-page theme for business sites. It comes with smooth parallax scrolling, a full-width beautiful header, and a professional look. Latte provides anything a business owner needs to promote their services, skills, and best portfolio. A modern and catchy theme for magazine websites and publishers, IsleMag comes with a user-friendly and editing-enabled design. It lets you display ads, post great image galleries, add various social media feeds, reviews, and use various colours to make its appearance even catchier. The theme provides you with good sliders and a boxed layout style. Flash is another minimalist theme for business and corporate purposes, with a simple one-page layout, a full-width slider, and a good portfolio section. Overall, it has a clean appearance that will make your services stand out. Bento is a universal free WordPress theme that offers wide customization opportunities and a set of powerful features, like a visual content builder, that enables anyone to create a professional website of any type, from small personal blogs and local business pages to large corporate portals and online shops. This theme is easy to use and follows SEO and UX global best practices. Moesia makes it as our bonus, free and responsive WordPress theme because it also ranks as one of the most popular and responsive WordPress themes out there that are surprisingly free. Moesia works as a beautiful WordPress theme for businesses of all sizes. It comes with 11 pre-defined blocks you can place on your homepage to build the site you desire. Each of the blocks that go on the homepage has the ability to work with parallax backgrounds, which is great for grabbing your readers’ attention. You can even set the background colours for the blocks. Several cool animations and effects are also included with the theme. So there you have it guys…The ultimate 20+1 free and responsive WordPress themes to use for your website this year. While it’s true that there are many free WordPress themes out there like the ones we have explained above, what stands these out is their popular use, ratings on responsiveness and overall user satisfaction. Try these free versions and leave us a comment about your experience.